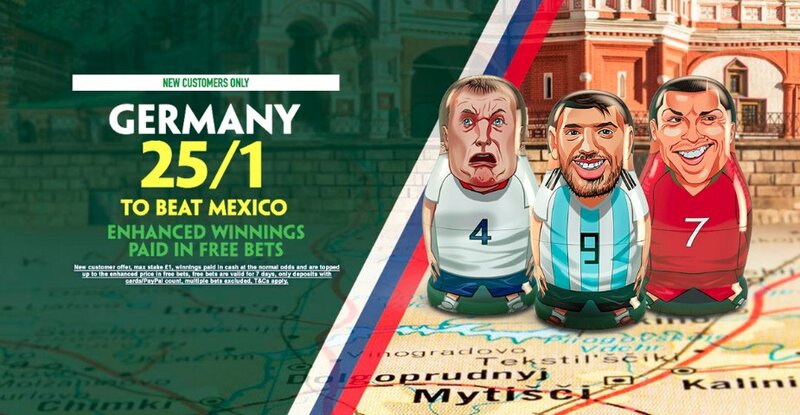 Paddy Power is offering new customers the opportunity to claim a special enhancement for on Sunday's World Cup action – a boosted 25/1 on Germany to beat Mexico! Normal price is 4/9! Don't miss this offer.. it's one of the best bargains on Russia 2018 so far! World champions Germany are aiming to make a winning start to the World Cup on Sunday and you have the chance to make a £25 profit by staking just £1 on Die Mannschaft to win against Mexico! Get 25/1 Germany to beat Mexico with Paddy Power! New Customers can get Germany at an enhanced 25/1 to beat Mexico. Max Stake £1. Winnings paid in free bets, valid for 7 days, only deposits with cards/Paypal count. Exchange and multiple bets excluded. T&C’s Apply. 18+|Gamble Aware. Register a new account with Paddy Power before the kick-off (5.00pm) and claim 25/1 Germany to win their Russia 2018 debut match against Mexico - What an insane price boost!! If Germany claim the bragging rights, Paddy Power will pay out at the quoted price immediately. They will top up your additional winnings within 24hrs. Get 25/1 Germany to win vs Mexico with Betfair! Who is Paddy Power Sportsbook? Paddy Power has quickly become one of the powerhouses of European gambling and it’s easy to see why. A state of the art website, an award winning mobile app, generous welcome offers and very competitive odds are the main features at Paddy Power. The range of betting options available is huge, both pre-match and in-play. This all makes for a perfect storm, meaning that Paddy Power is UK punters' favourite choice when it comes to betting. They scored a joint European-record 43 goals in the process. In the most recent friendlies, the Mexicans recorded a goalless draw against Wales, a 1-0 win over Scotland and a 2-0 defeat at the hands of Denmark. The "Germany to win" bet is normally backable at 4/9, unless you claim this amazing offer..
Paddy Power are offering all BetAndSkill readers a special price of 25/1 Germany to get all three points against Mexicod, click here to get your monster enhancement in less than two minutes! New customers only. Available to residents of UK or Republic of Ireland, aged 18 or above. Open a new account using promo code YFBC63. Place a bet on Germany to beat Mexico in the ‘Match Odds’ market at the NORMAL price on the Sportsbook. If your bet is successful, you will be paid in cash based on the normal price on site and will have the extra amount, bringing the bet up to the cumulative 25/1 payout, credited in free bets. The free bets will be awarded within 24 hours of the end of the match. Free bets are valid for 7 days. Cashed Out and Partially Cashed Out bets will not qualify for this promotion. "25/1 Germany to beat Mexico at Paddy Power (World Cup crazy price)"